This cozy hidden gem is situated on a cul de sac in a quiet area of Nassau. This accommodation offers a parking garage with remote access. Just a 5 minute drive to the beach and 7-8 minute drive to downtown nassau and/or the famous Atlantis resort and casino, your in the middle of it all. With just a short walk to the mall at Marathon for light shopping and eating your in the middle of almost everything. There are bars, restaurants, pharmacies, gas stations, food stores, fast food, pizza, and many more within walking distance of this location. There is also the public bus for $1.25 per person. Should you require assistance with anything else you are free to contact the property manager at anytime day or night. Dawson's hideaway was a nice place to stay, the owner was very pleasant and welcoming. There are quite a lot of places within the area to walk to, like places to eat, bars and the mall is just a short ways away. A nice well kept yard with fruit trees that provided a lot of shade from the sun. I would recommend traveling with mosquito repellent for the evening to avoid mosquito bites. we purchased from the pharmacy on the corner. My husband, myself and our daughter traveled and stayed for 3 night and we would definitely stay here again. We thank you very much for taking the time to submit a review and we are glad that you enjoyed your stay. We look forward to your return in the near future. 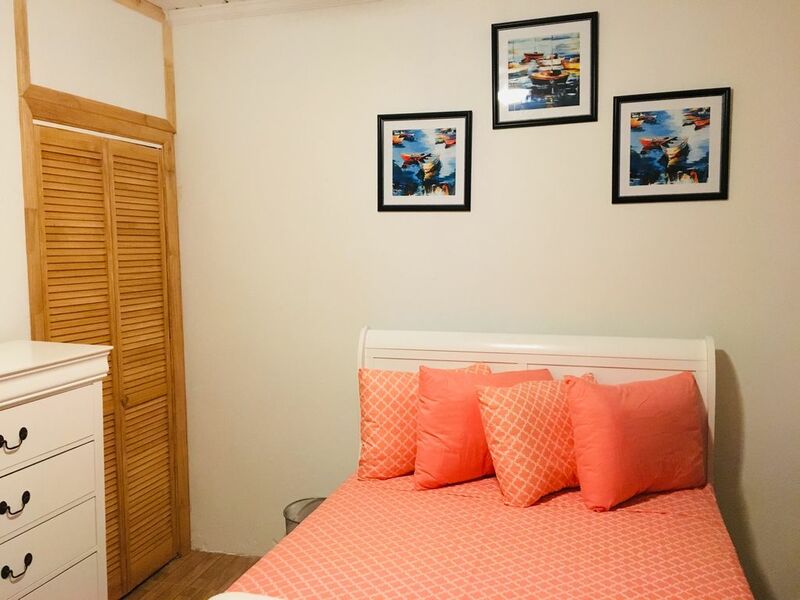 This one room, one bath, living accommodation is situated on a cul de sac in a quiet area of Nassau with very friendly neighbors. With just a short walk to the public transportation pick up, you are free to travel anywhere for just $1.50 per person. This accommodation offers a one car parking garage along with a gate remote. With just a short walk to the mall at Marathon for light shopping and eating your in the middle of almost everything. There are also bars, fast food, 3 pharmacies, a gas station, Wendy's fast food, pizza, and many more within walking distance of this location.